The Gusi Peace Prize traces its roots through the efforts of Capt. Gemeniano Javier Gusi, a World War II guerilla who fought against Japanese oppression, turned politician, and became popular for his fight for human rights. (Ambassador Barry Gusi is the son of Captain). The annual awards ceremonies are held by Gusi Peace Prize foundation, an organization in Manila which is responsible for humanitarian work for the communities of the poor in Philippines. The Foundation was founded in 2003 by Barry Gusi to continue the philanthropic work of his parents. It is a charitable foundation which aims to give honor and awards to distinguished individuals or groups worldwide with exemplary contributions to social, peace and human rights. The Gusi Peace Prize International is awarded to outstanding people or groups of people specializing in different fields of science, medicine, politics, literature, art, business, philanthropy, journalism, religion, international relations, architecture and biology. The Foundation receives more than 1000 suggestions every year, but the committee chooses 10–15 of them. In 2011 we received more than 1300 suggestions but Vladimir Megre is the laureate of Gusi Peace Prize International 2011. Every fourth Wednesday of November is declared as the «GUSI PEACE PRIZE INTERNATIONAL FRIENDSHIP DAY». 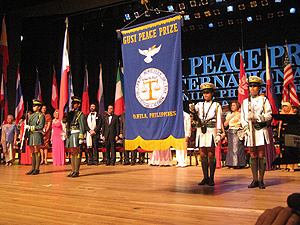 This is why the awards ceremony of Gusi Peace Prize International 2011 will take place on November, 24, 2011 in Manila, Philippines.